The hottest and most glamorous designs that really put you in the spotlight. Whether you�re looking for the perfect prom dress, winning pageant dress, sassy & short homecoming dress, or the dress that say�s you�ve got that sophisticated individual style for your next Quincea�era, Winter Ball, or exciting Red Carpet event, we have exactly what you want at the Pageantry & PromTime Online Fashion Boutique. 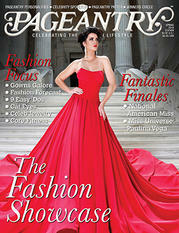 Pageantry magazine features a gown by Mon Cheri's Laine Berry and PromTime magazine features a gown by Blush.